Since chile peppers are often an integral part of a Mexican (or Indian or Thai, or other) dish, it’s not usually a good idea to just leave out the spicy ingredient because you will sacrifice a large amount of flavor (not to mention authenticity) along with the piquancy. Consider one or more of the following methods of reducing a fresh pepper’s spiciness on the tongue while conserving its distinctive flavor. 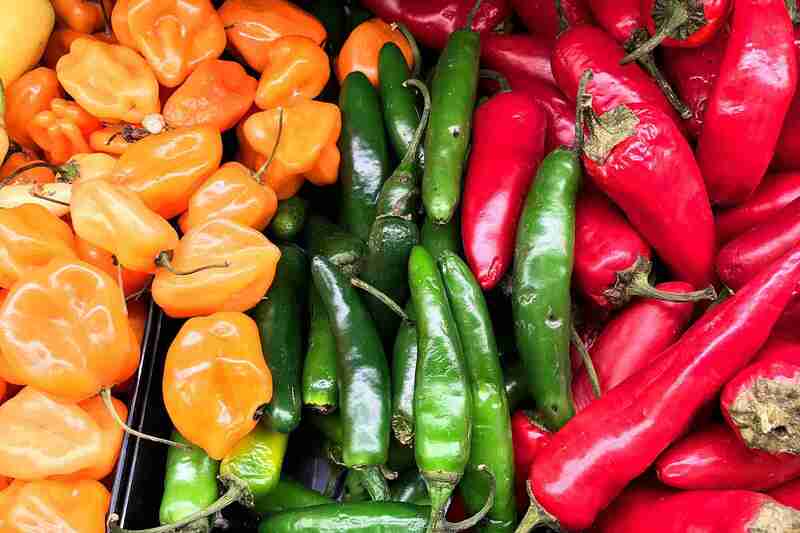 Capsaicinoids are the compounds naturally present in peppers that produce the sensation of heat. Different chiles are just naturally spicier than others because they contain more of these compounds. U.S.-grown Anaheim peppers, for example, have been bred to be relatively mild, while habanero peppers are searingly hot—and there are many varieties of chiles in between these extremes. One measure of a pepper’s piquancy is the Scoville scale. Becoming familiar with this scale will help you plan which types of peppers you want to use in your cooking. Capsaicin, the substance that human membranes perceive as “hot,” is concentrated in a chile pepper’s seeds, veins, and pith. If you can remove these, you are well on your way to a milder dish. If you can scrape off the innermost layer of flesh inside the chile, too, you will remove even more of the capsaicin. Always wear gloves while working with hot chiles, and never, ever touch your eyes while doing so. Putting a fresh, cut open uncooked chile pepper under running water will rinse off some of its heat. The water in this method will take away a significant amount of the pepper’s flavor along with its heat. This technique is not recommended if you are roasting and peeling peppers (such as poblano chiles) because rinsing will take away all the delicious smoky goodness you obtain with the roasting. Rinsing uncut peppers under running water, like those shown in the photograph, will have no effect on spiciness. Soak Chiles in a Vinegar and Water Solution. This method is useful when making stuffed jalapeño peppers, which starts with chiles that have been boiled for a few minutes. Submerge seeded, cooked whole jalapeños in a mixture of 1 part vinegar to 3 parts water and let them soak for about an hour. If after that time they are still too hot for your taste, drain them, add more vinegar and water, and let them soak a little more. This method helps temper the jalapeños’ heat without destroying their distinctive flavor. Peppers need to be cut open for this to work. Capsaicin is a fat-soluble compound, which is why drinking whole milk with a spicy food can decrease the discomfort caused by the chile, but guzzling a gallon of water won’t help at all. Cream or cheese (or cream cheese) will have a similar effect if served in, on, or beside your dish, as will other fat-rich foods such as avocado. Acidic ingredients also neutralize capsaicin’s burn somewhat, so squeezing some fresh lime juice on a spicy food can help a bit. A small amount of chile pepper in your salad can be better tolerated with an acidic vinaigrette type of dressing. Capsaicin activates pain receptors on the tongue—the same receptors activated by heat, which is why we perceive chile peppers as “burning” us. Nobody, not even people born in pepper-consuming countries, is born liking chile peppers; we all have to gradually learn to enjoy this singular pain/flavor sensation. Babies are not fed spicy food; children are introduced to hot peppers gradually as they get older. If you did not grow up eating them, don’t expect to take to hot chiles right away. Start eating them gradually, perhaps using one or more methods on this page to tone them down. Little by little, your taste buds and internal organs will become accustomed to the effects of the capsaicin in peppers, and in time you will grow to tolerate and even enjoy more heat. Along the way, you will become attuned to the flavor differences among different varieties of pepper. Be assured that, although a hot pepper feels like it is burning your mouth, it will not do any permanent physical damage to your tissues; temporary redness and inflammation are the only unpleasant effects caused by the substance unless the capsaicin amount is extremely high.